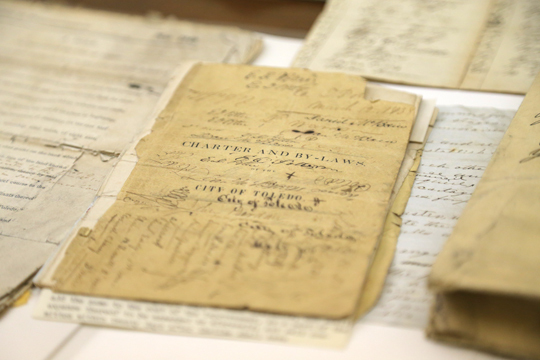 The fragile pieces of paper inside, which had been carefully folded and stored by city employees at some point in history, document the original charter and bylaws of the city of Toledo printed in 1837, the year the city was founded. The “Charter of the City of Toledo Year 1837” was discovered in a safe in the attic of Toledo’s Safety Building. The document from the year the city was founded is now preserved in the Canaday Center for Special Collections. 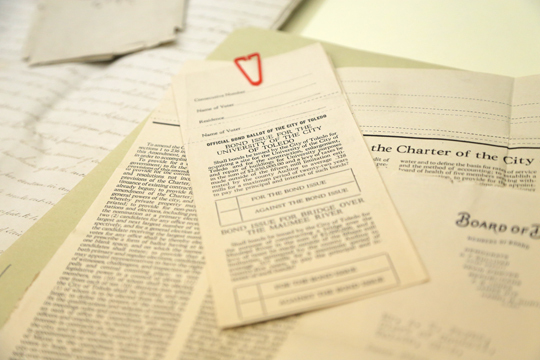 The charter document that includes numerous amendments — some written directly on the charter, another written out in longhand and attached to the back of the document — is now permanently preserved in the Canaday Center in UT’s Carlson Library, where it will be housed in a temperature and humidity controlled environment and available for public viewing. The University will present these historic documents to the public at an event Tuesday, Sept. 19, at 10 a.m. in the Canaday Center with UT President Sharon L. Gaber, Toledo Mayor Paula Hicks-Hudson and elected city officials. In addition to the original charter that features the signature of Toledo’s first mayor John Berdan, the safe contained a poll book for the year 1836 with a handwritten list of the 226 individuals living in the township of Port Lawrence who were eligible to vote in the city’s first election. It was dated Oct. 11, 1836, and contains the names of many of the most important people in the history of the city, including Benjamin Stickney and Stickney’s son, Two Stickney. “These would have been the individuals who voted in the election for Toledo’s first mayor,” Floyd said. The collection of historic city records also includes several other iterations of the charter from the 19th century — folders of handwritten amendments from 1845 and 1851, and a complete charter from 1846 that bears the certifying signature of Ohio Secretary of State Samuel Galloway from back when city charters had to be approved by the state legislature. A 1928 ballot for the UT bond issue was among documents discovered in the attic of the Toledo Safety Building. Voters approved the bond, which raised $2.8 million to build on what is now UT’s Main Campus. The city records also document some details of the history of The University of Toledo. One handwritten piece dated 1874 concerns an effort by the trustees of the Toledo University of Arts and Trades, which had been founded by Jesup W. Scott two years before, to give the assets of the University to the city of Toledo after Scott’s death. That did not happen, and the University closed four years later. In 1884, what remained of the University’s assets was turned over to Toledo, and the school reopened as a municipal school that year, which it would remain until 1967. The collection also contains a ballot and certified election results for the bond issue approved by voters in November 1928 that raised $2.8 million to build UT’s Bancroft Street campus. The newest records found earlier this year in the Safety Building were added to existing local historical documents the Canaday Center acquired two years ago; these include the first minute book of Toledo City Council from 1837, records of Toledo’s city manager dating from 1947, and a large collection of annual reports from city departments, dating from the 1890s. Some of the city documents will be on public display in the Canaday Center’s next exhibit, “Preserving Yesterday for Tomorrow: The Best of the Ward M. Canaday Center,” that is slated to open in early November. This entry was posted on Wednesday, September 13th, 2017 at 3:59 am and is filed under Events, Library, News, Research, UToday .